Prospect.io is a sales automation platform designed specifically for sales teams, offering tools for prospecting, emailing, analyzing, and data synchronizing. The cloud-based tool allows sales team members to identify opportunities, manage outreach, automate data entry, and track performance from one platform. Prospect.io integrates with a range of third party apps including Pipedrive, Salesforce, Hubspot, Close.io, and Slack, to automate data synchronization and ensure that prospecting workflows and sales pipelines flow seamlessly through multiple systems. With Prospect.io, sales teams can find and verify email addresses when prospecting. Using the Google Chrome extension, users can crawl social networks and web pages to find prospects' email addresses, names, job titles, companies, and more. Prospects can also be added to the system in bulk when there are multiple email addresses linked to one domain, and users can search for a specific person’s details by entering their name into the extension search tool. Prospect.io automatically verifies email addresses in real time as they are collected, to ensure that they really exist, and email addresses can also be verified in bulk for CSV list imports. Prospect.io can also be used create, schedule, and monitor drip email campaigns for nurturing leads and closing sales. Emails can be adapted from existing templates, or custom templates can be created and saved for later use. Sales teams are able to schedule their email sequences to send at specific times, and setup triggers to stop campaigns automatically when prospects reply, click, or convert. In order to help businesses gain insight into campaign effectiveness, Prospect.io provides reports and analytics on email opens, clicks, replies, bounces, conversions, and more, and emails can be analyzed to understand how they compare to other campaigns within the industry. Great product with multiple sales tools all rolled into one. Would recommend to any sales and marketing team and pricing is very competitive. Lead retrieval is excellent and mostly accurate and the LinkedIn widget is clever and unobtrusive. Drip campaign for the most works, UI was a little clunky to begin with but recent update has made it a little easier on the eye. Lead retrieval is excellent and mostly accurate and the LinkedIn widget is clever and unobtrusive. Drip campaign for the most works, UI was a little clunky to begin with but recent update has made it a little easier on the eye. Drip email logic can be slightly confusing. Thank you Yannick for this review. Really appreciate! I was expecting some errors with the lead gen but I was pleasantly surprised by how accurate the lead information actually was. They also have a direct Chrome plugin so you can grab emails right from LinkedIn, build lists, and run drip campaigns. I feel like I run out of leads faster within certain categories. Either the information isn't as accurate or it's difficult to grab any information at all. But I understand that can be expected when I'm searching so many leads each day. I love the design of the site. It's clean, minimal, and sleek. The #1 feature that it has that most others lack is the ability to reorder drip campaigns once they have started. This is invaluable. Sadly, there are lots of shortcomings of this software. For instance, you can't automatically start people in a drip campaign once they have been added to a list. You can't A/B test specific emails within a campaign - you have to clone the entire campaign to test one variable. Also, you can't start someone on a specific step of a campaign (so when people have already recieved one of my emails as a cold email and I want to move them into a trickle campaign, I have to create a whole new campaign that starts on that particular step). Super useful and easy to use prospection tool for people who want to find and close deals ! Great tool for personalised mass emailing. Works like a charm. Fast & efficient support. To be discovered !!! Prospect.io pricing is based on the number of credits needed each month. A credit can be used to send 1 email to a prospect, find 1 email address on a prospects website, or verify 1 email address. 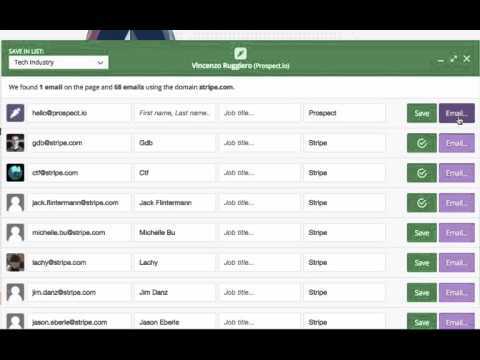 Find and verify email addresses using the Prospect.io Google Chrome extension which maps any website or social media page for the email addresses, job positions, names, and other relevant details of prospects, and verifies the email addresses automatically. Create drip email campaigns to attract and convert prospects. Email campaigns can be customized from the pre-existing email templates, or created from scratch, and sent to prospects in bulk. Track emails for opens, clicks, replies, bounces, and conversion, and analyze the overall campaign performance against competitors in the industry. Gain insight into other aspects of sales performance with visual reports on metrics such as number of prospects creates, number of emails sent, employee performance, team performance, and more. Integrate Prospect.io with CRM systems including Pipedrive, Salesforce, Hubspot, and Close.io for automatic data synchronization, as well as a range of other third party applications through Zapier and PieSync. Below are some frequently asked questions for Prospect.io. Q. What type of pricing plans does Prospect.io offer? Q. Who are the typical users of Prospect.io? Q. What languages does Prospect.io support? Q. Does Prospect.io support mobile devices? Q. Does Prospect.io offer an API? Yes, Prospect.io has an API available for use. Q. What other apps does Prospect.io integrate with? Q. What level of support does Prospect.io offer?